The US considered the use of fear of aliens as a psychological warfare tactic Details of the shocking plan are buried in once top secret Central Intelligence Service (CIA) UFO files now published on the agency’s website. 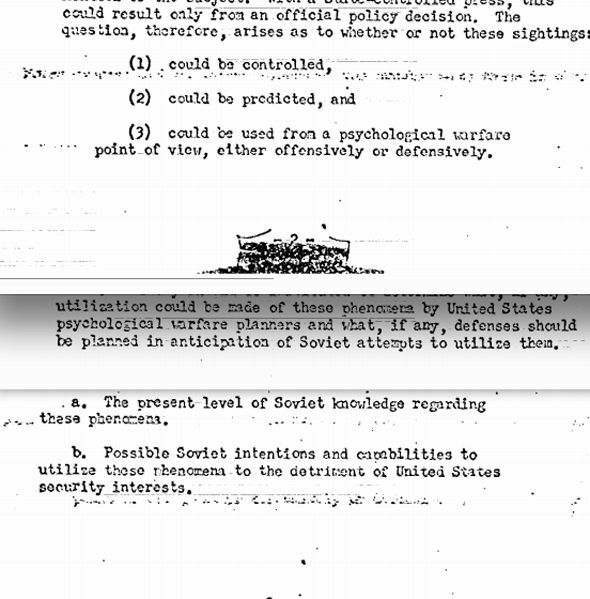 The potential weapon was discussed in a memo from Marshall Chadwell, assistant director of Scientific Intelligence, to General Walter Bedell Smith, CIA Director of Central Intelligence, which was sent in October 1952, when the CIA was deeply involved in investigating the UFO and flying saucer phenomena following an explosion in sightings. The memo was sent at the height of the Cold War and considered if the number of UFO sightings could be predicted or controlled or, more sinisterly, even “used from a psychological warfare point of view, either offensively or defensively”. It said studies showed public concern, not just in the US but wider, with the phenomena, was so strong that many people may be pre-conditioned to accept the incredible as being true. The memo added that news of potential alien activity had the potential to spark mass hysteria and panic. Since 1947, the Air technical Intelligence Centre, had received 1,500 official sighting reports, plus more from the public and press. In July 1952 there were 250 reports, and of all sightings 20 per cent remained unexplainable.